Image caption Mr Borg said Sweden's experience of a financial transaction tax was "very bad"
A European financial transaction tax is unlikely to raise the sums of money projected as it would encourage firms to move overseas, Sweden's finance minister has told the BBC. 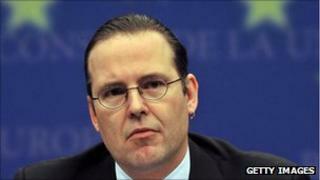 Anders Borg said Sweden abandoned its own transaction tax after most trading companies left the country. The tax "had a very detrimental impact on our financial markets", he said. If the European Union introduces the tax, firms could simply move to New York or Asia, Mr Borg said. Sweden introduced a transaction tax on financial firms in the 1980s. "Between 90%-99% of traders in bonds, equities and derivatives moved out of Stockholm to London," Mr Borg said. "The impact was basically that we did not get any tax revenue. It brought in very little tax money while moving most of the businesses outside of Sweden. "We abandoned [the tax] because it was a very, very bad functioning tax." The fact that the US has said it has no intention of introducing a similar tax, meant that firms would be free to move to other financial centres, Mr Borg said. "So we are basically taxing growth away from Europe, and that is not a very good idea. "I hope [policymakers] realise they might be losing out themselves. This is not a stable tax base." Mr Borg said he was in favour of making the banking system pay, and making it more robust, but that any measures designed to bring this about should not push firms out of Europe. The UK has also been vocal in its opposition to the tax proposed by the European Commission earlier this week. A spokesperson for the UK Treasury said it would "absolutely resist" any tax that was not introduced globally. London would be hardest hit by the tax as the majority of banking transactions in Europe come through the city. However, a number of other European countries are in favour of the tax, including France, Austria, Belgium, Norway and Spain. The commission has said it will look at implementing the tax just in the 17 member states of the eurozone if other EU members oppose it. Under the proposals, the financial tax would be levied at a rate of 0.1% on all transactions between institutions when at least one party is based in the EU. Derivative contracts would be taxed at a rate of 0.01%. The tax would raise about 57bn euros ($78bn; £50bn) a year and would come into effect at the start of 2014, the commission said.